Rupert Murdoch turns 84 on March 11. In an effort to spread some (early) joy to the old fella’s heart, the rest of the Murdoch clan surprised him with a young fella — a golden doodle puppy. 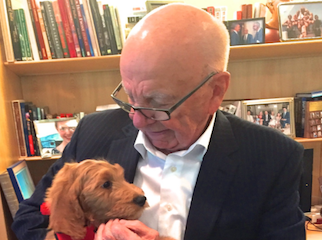 Murdoch’s last dog died four years ago, and recently he had been talking about getting a new one. Just look at Rupert’s reaction! We have our issues with the man, but this is pretty damn fun. Consider this further proof that dogs are the best and cats are definitely not.